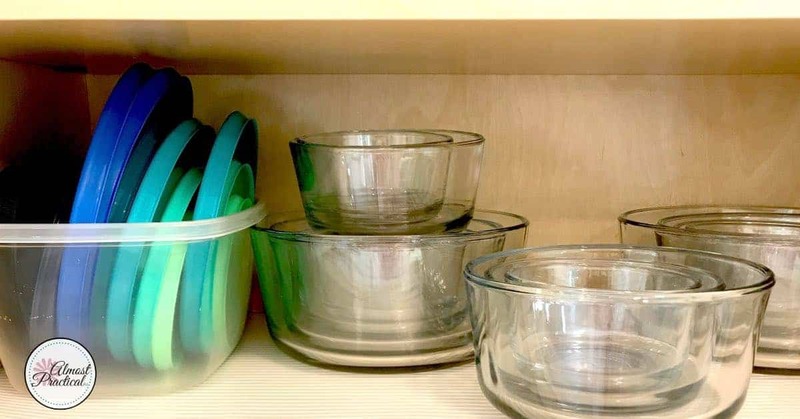 You can use this simple tip to organize your Pyrex lids. If you have a lot of food storage containers, like me, you might find it hard to keep the lids organized. Nothing is more frustrating than filling up a container with leftovers and then not being able to find the lid. And then you have to transfer the food to another dish – and wash out your first choice because that wasn't going to work. After dinner clean up then ends up taking way longer than you wanted it to. The thing about Pyrex lids is that they don't really stack with the containers, so you are left to come up with some creative storage ideas. Well, I just picked up this set of glass storage containers from Amazon and I knew something had to change. There was no way I was going to continue to have a disorganized mess on my hands. So, I started looking for a Pyrex lid organizer. But nothing really jumped out for me. So, I came up with this. Find an inexpensive rectangular food storage container or bin. I use something like this one – mine is pretty old, so I can't tell if it is this one exactly, but it looks pretty close. Just make sure that the rectangular container that you choose is longer than the diameter of your largest Pyrex lid. 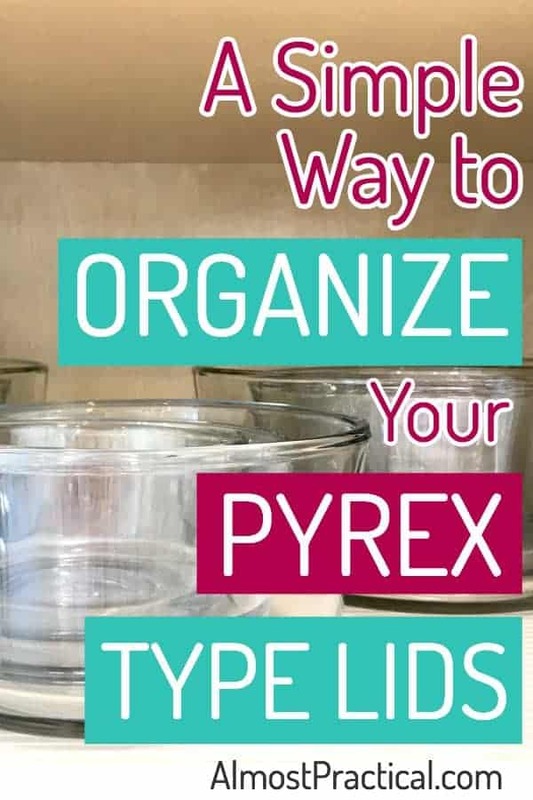 Now, put all your Pyrex lids into the rectangular container vertically and place it on your kitchen cabinet shelf next to all your glass Pyrex food storage containers. The vertical presentation makes it really easy to find the exact lid you are looking for. The thing with glass food storage containers is that the glass seems to last forever, but over time the plastic lids tend to break down and crack. Years of heated dishwasher cycles and cold refrigerator storage really do take a toll. When this happens, you can just start over – which is what I ended up doing this time around (thank you Amazon Prime Day!) or you can get replacement Pyrex lids or Anchor or any other brand for that matter. It is more economical to get new lids, and it is better for the environment, too. Do You Have a Creative Solution? Do you have a creative way to organize Pyrex lids? If so, tell us in the comments below. The thing is – the space that we all have is different. After my kitchen remodel, I store my Pyrex and Anchor Hocking food storage containers in my upper cabinets. But some people may use a deep drawer or a pantry shelf instead..
That is why it is always helpful to hear different ideas. I look forward to hearing some of yours! Hi, Neena! That is a great solution. It’s almost like a little bookshelf for plastic lids, which I guess just magically grow legs and walk off to another part of my house. (OK, that’s not true, but it seems like it on busy evenings.) Your posts are definitely written from a busy Supermom perspective, so that’s someone I love reading new content from and making a new blogger friend with. Thanks for the post, and have a great Monday! Mine aren’t that old and I don’t put them in the dishwasher, but they seem to have shrunk. That is a bummer. I haven’t had that happen, but I would say that keeping them out of the dishwasher probably is a good move.